London - Arsenal boss Arsene Wenger is refusing to concede defeat in the Premier League title race even though his team are now 15 points adrift of Manchester City in top spot. Mauricio Pochettino has ruled Tottenham out of contention but Wenger is refusing to throw in the towel despite Saturday's painful 3-1 loss to Manchester United. The Gunners, who last won the trophy in 2003-04 and have three more points than rivals Spurs, are lagging in fifth spot after five defeats in their first 15 games. "I am not Pochettino, I am Arsene Wenger," the Frenchman said. "I am here to fight as long as I can. As long as mathematically it's possible, you have to fight. You cannot give any other message out." Wenger believes the performance in the loss to United, who capitalised on two defensive howlers, has revived belief within his squad. "I believe from the game, it has to make us angry and even more determined," added Wenger, whose side dominated possession and produced a succession of chances but were thwarted by United goalkeeper David De Gea. "If I am a player, and I think with what we produced, we have a huge potential, and we lose the game. We cannot accept that. "That's what you want, the players have produced a quality performance. "What makes you angry is that you produce that performance and in the end you have nothing to show for it. That's very difficult to accept." 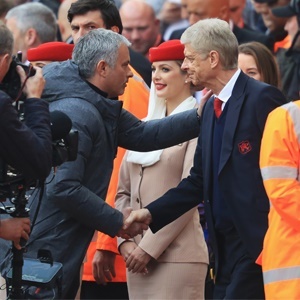 Wenger welcomed the positive reaction of the Emirates Stadium crowd to Arsenal's performance. "The crowd sees as well that the team produced what is expected from them. The crowd was outstanding. And the team was outstanding. But we were not efficient. I cannot deny that. They have scored three, we have scored one." Arsenal next travel to the St. Mary's Stadium in an English Premiership clash against Southampton and will be aiming to make up ground on the Manchester clubs. Kick off is at 14:00.